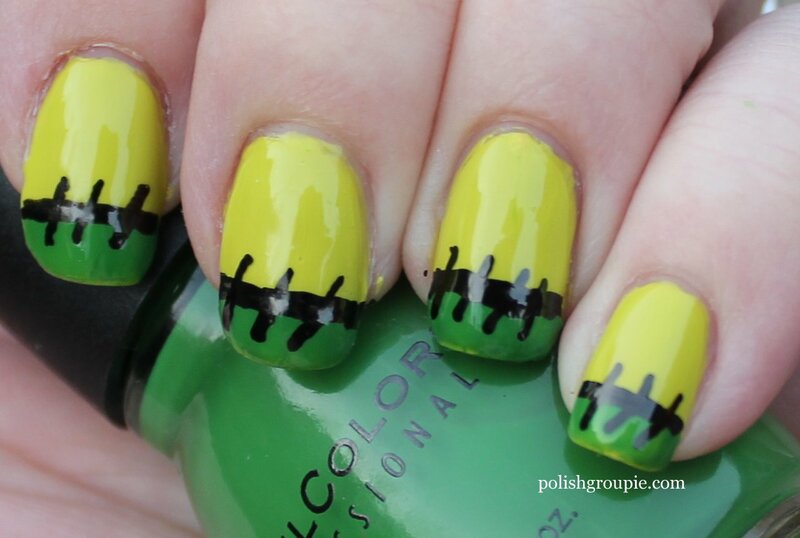 Here’s Day 3 of the Tri-Polish Challenge from Crumpet’s Nail Tarts. The three colors I chose are Sinful Colors Island Coral, Sinful Colors Amethyst and Julep Courteney; I used all three here for this basic argyle pattern. 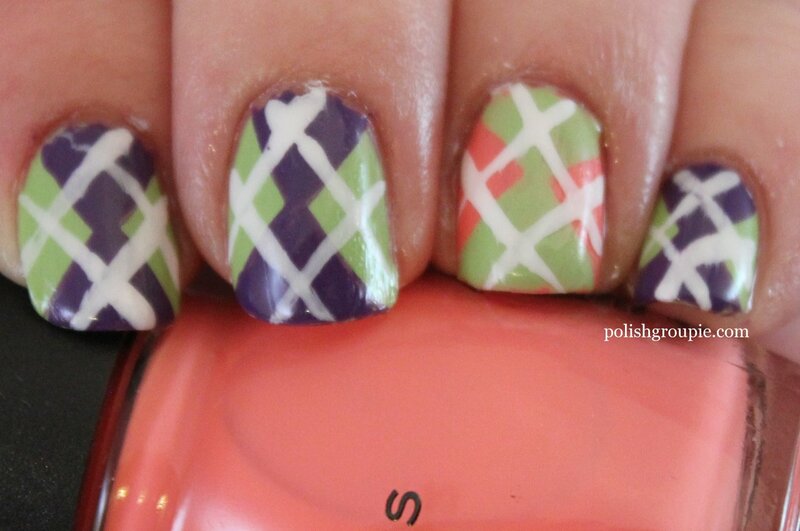 There’s a video tutorial from Cute Polish on the argyle pattern if you’d like to see how to do it. 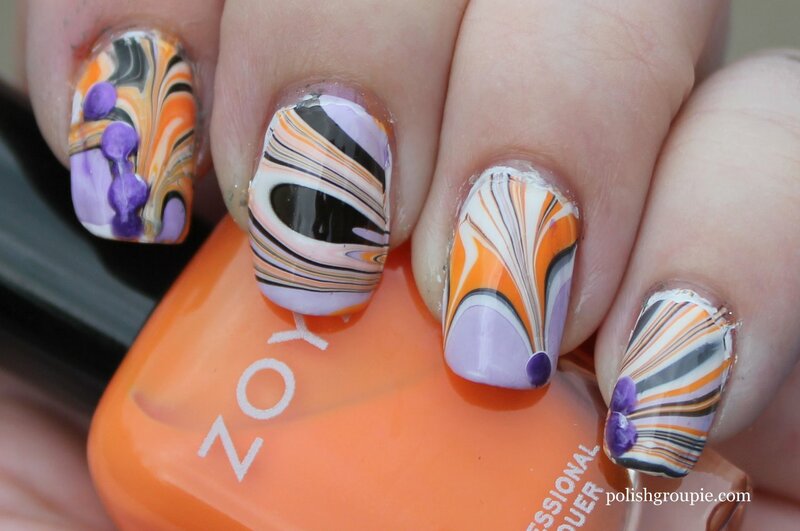 I used two coats of Julep Courteney as the base and then used a striper brush to paint on triangles with Sinful Colors Amethyst, and then added white lines with Kiss Nail Art Paint striper polish in white. 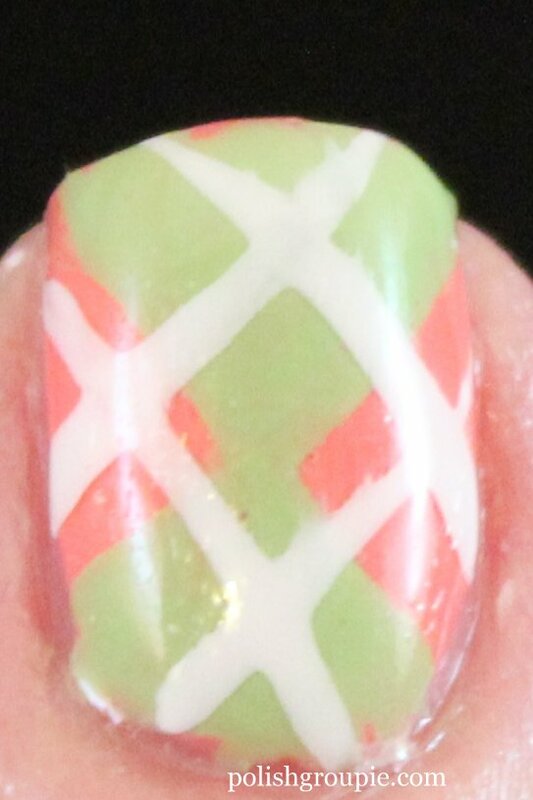 For the accent nail, I used Sinful Island Coral as the base with Julep Courteney on top. 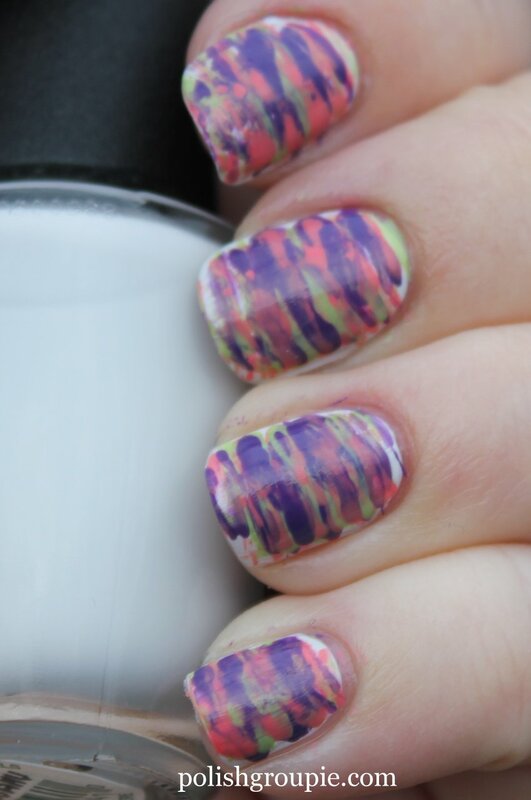 I topped it off with a coat of Poshe fast-dry top coat. 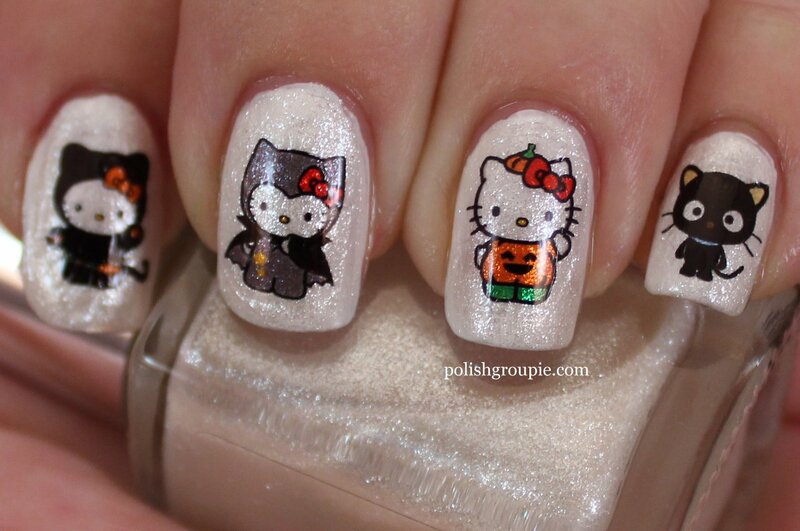 I’m starting a new nail art challenge today. 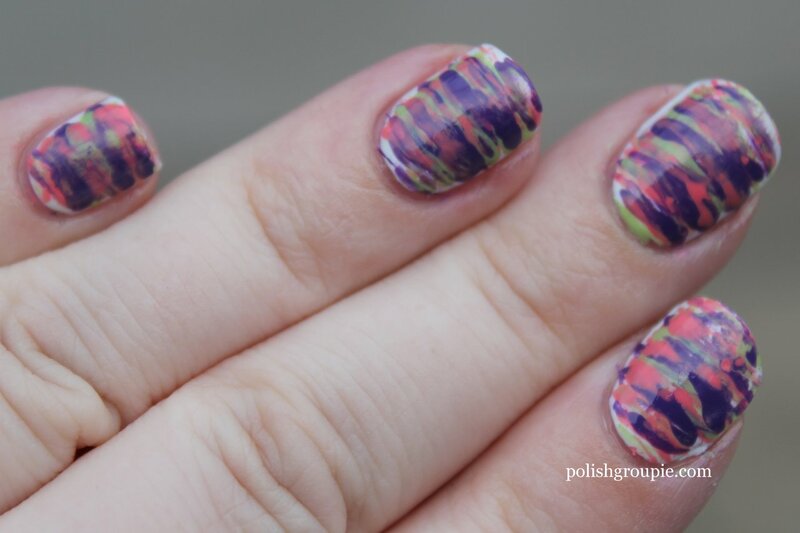 This is the Tri-Polish Challenge from Crumpet’s Nail Tarts. The three colors I chose are Sinful Colors Island Coral, Sinful Colors Amethyst and Julep Courteney. 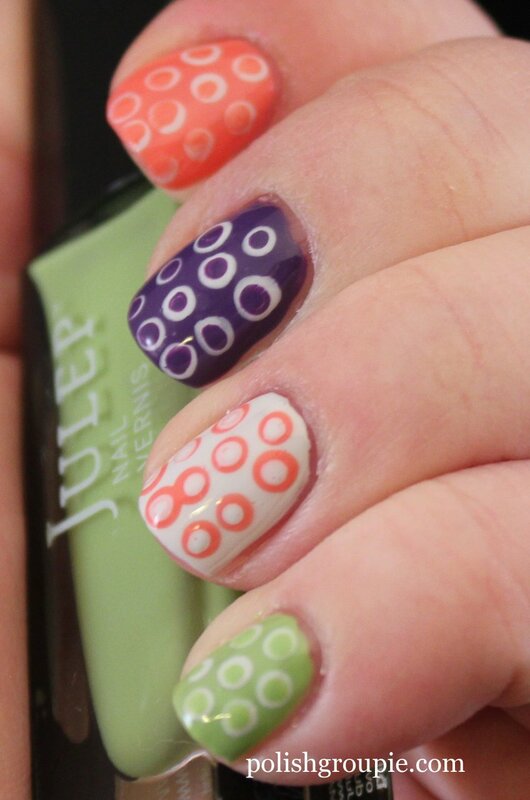 I went for a simple dotticure, starting with the base color, adding a white dot and then a smaller dot of the base color. The index finger white base is OPI My Boyfriend Scales Walls, the same white I used for the dots. 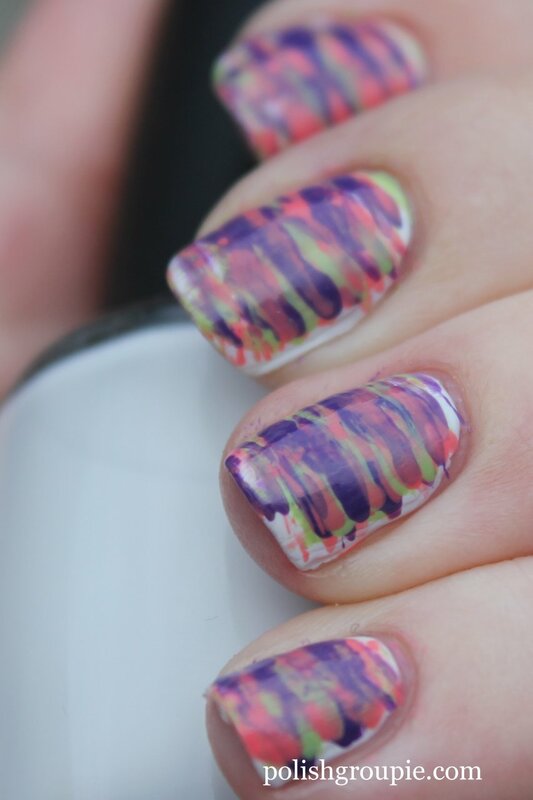 Nothing too crazy, just wanted to get back into the nail art game. Today is the first day of the 12 Days Of Christmas Nail Art Challenge sponsored by Pink & Polished Nails and Over Polished. The theme for today is Christmas Trees. 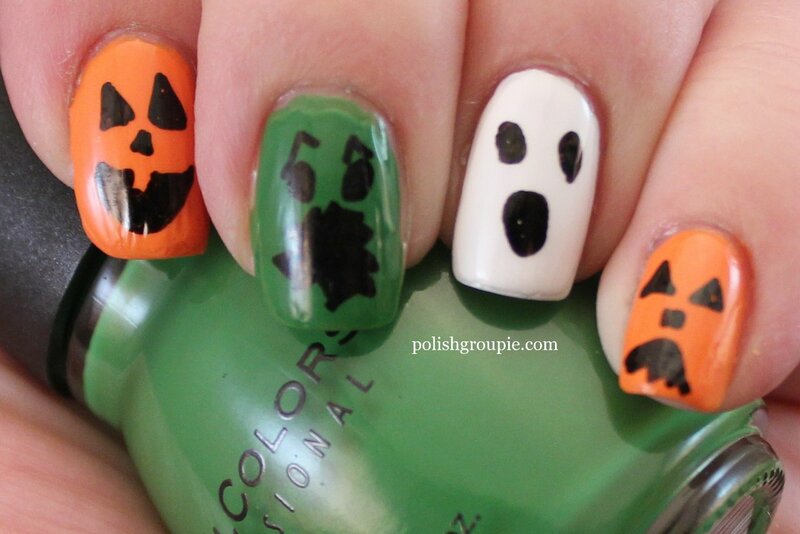 I started with three coats of OPI My Boyfriend Scales Walls, a grayish white creme. 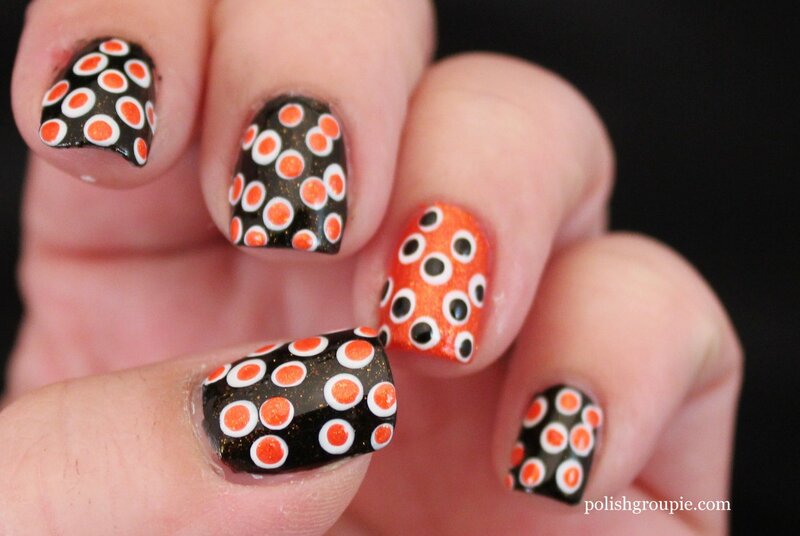 I then used tape to create a triangle on my ring finger and then filled it in with dots in various sizes. The red is Ulta Steppin Out, the green is Sinful Colors Exotic Green and the gold is Essence A Piece Of Forever from the Twilight Breaking Dawn Part 2 collection. 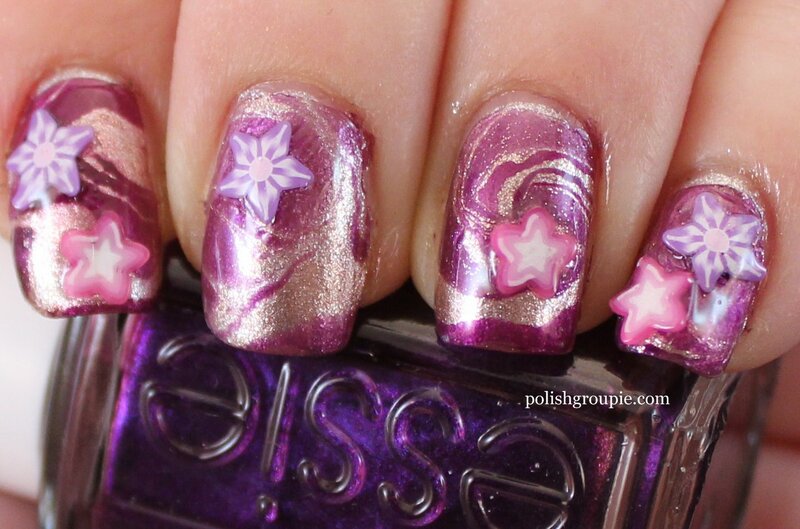 I used a silver Kiss Nail Art striper to add some tinsel. I outlined the sides of the tree with a green It’s So Easy Stripe Right striper and added a star-shaped rhinestone at the top. 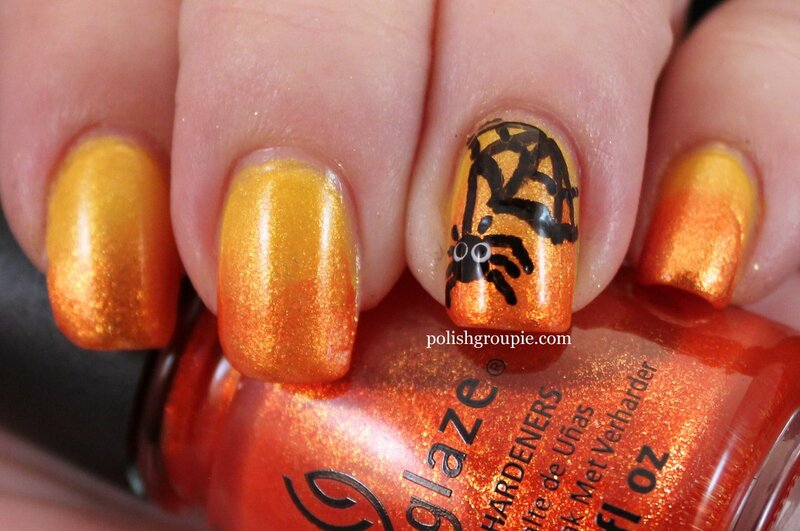 Everything is topped off with Poshe fast-try top coat. 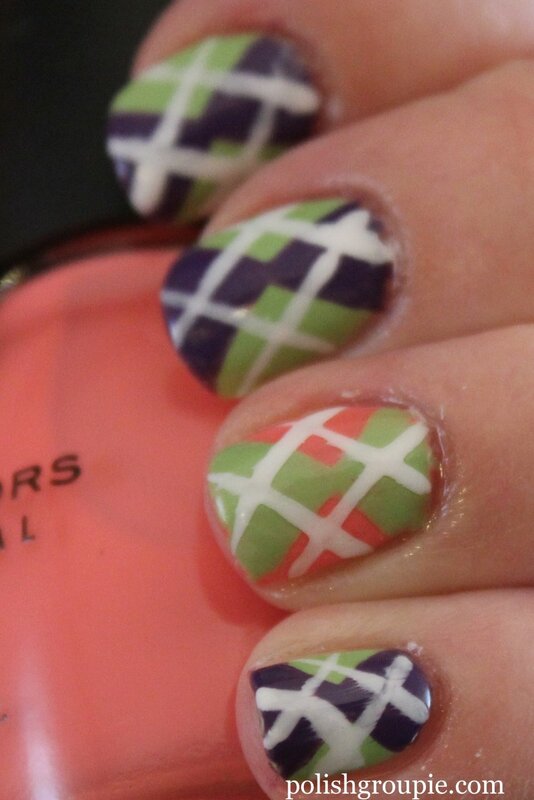 The dots on the other nails are Ulta Steppin Out and Sinful Colors Exotic Green.